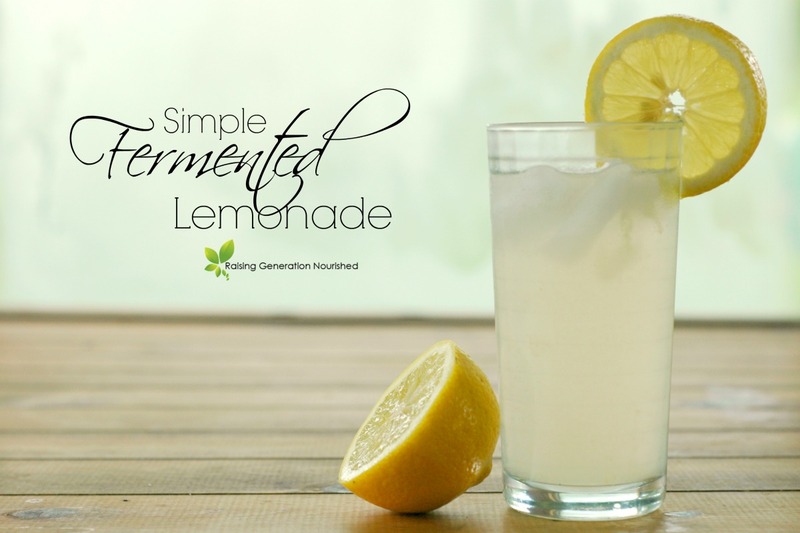 Bring that classic summertime drink up a few notches with a big probiotic boost from this simple fermented lemonade! Refreshing *and* nourishing all in one! Fermented lemonade is a fun summertime tradition in our house every year! I can’t think of many other things more “summer” than lemonade, but if we are going to be sipping on something more than a couple times a month during a season, I want it to have some nourishment to it. Letting your lemonade sit for a few days with some probiotic-rich whey to ferment fills it with gut nourishing flora – and it tastes really good! To get your whey, just scoop a container of plain whole yogurt into a dishtowel, tie it up onto a cupboard door, and let it drip into a jar – the liquid dripped off is probiotic-rich whey! The leftover yogurt in the towel is like Greek yogurt or cream cheese – yum! This batch makes a good gallon of lemonade. 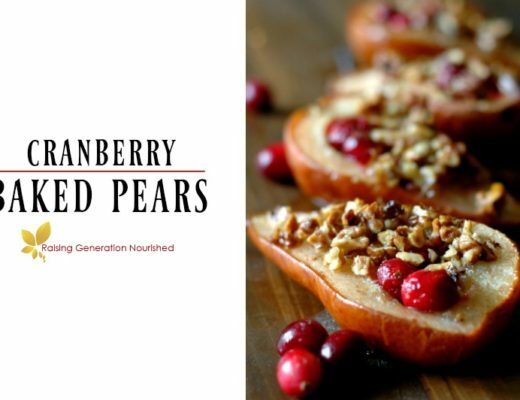 It is so delicious right after the first ferment – or you can bottle it and give it a second ferment to give it a bubbly, fizzy finish! 1 cup whey Just scoop a container of plain whole yogurt into a dishtowel, tie it up onto a cupboard door and let it drip into a jar - the liquid dripped off is probiotic rich whey! The leftover yogurt in the towel is like Greek yogurt or cream cheese - yum! Put your lemon juice, sugar, and whey into a gallon glass jar, and fill the rest of the way with water leaving a few inches at the top. Put your lid on the jar, shake it up carefully, and leave it in a warm spot in your house for 3 days. If it is extra warm/humid you may only need about 2 days. The longer you leave the lemonade the more sugar the bugs will eat up - you can taste it every day if you want to test for sweetness. Transfer your fermented lemonade to the fridge - I like to transfer mine into swing top bottles (fills about 6 of my swing top bottles) to keep it fresher - and because I like to give them a second ferment to make it bubbly! You can do this by leaving your fermented lemonade in the swing top bottles for about 3 extra days. Just add another tablespoon of sugar to each bottle to feed the bugs. The second ferment may take longer if the temperature in your house isn't very warm. Just test it after a few days to see if it is where you like it to be. It will get fizzier with time. For more real food drink ideas, you can follow my Drinks board on Pintrest! Hi Renee, a few questions for you: How long does this keep in the refrigerator? Do your kids like it? And what are the health benefits in your opinion? Sugar typically has a bad rap, is the sugar in this bad for someone who has cancer? Thank you! Hi May! 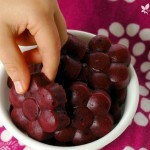 You can use a ginger bug culture or water kefir grains! This sounds so good! I can’t wait to try this. So easy for those of us that want to make ferments but feel a bit uneasy about making things like kombucha. Yes! This is a great start for those new to ferments! It is pretty tough to mess up and it is really easy! 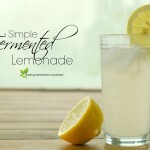 Great idea to ferment lemonade! I’ve been experimenting with other ferments (beet kvass, preserved lemons, kimchi) and am looking forward to trying this. Since I’m dairy-free, I’ll have to try the water kefir grains. Sharing on Pinterest. Thanks! Thank you Carol! 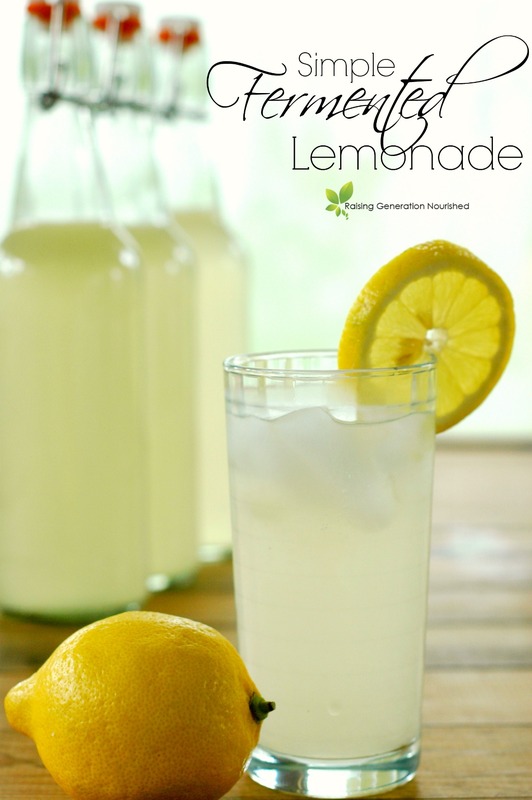 You will love the water kefir lemonade! It is super good too! 1. 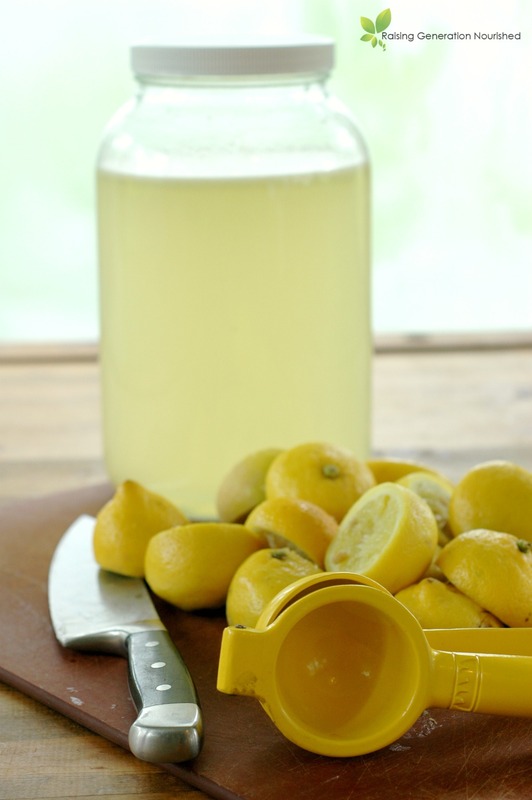 Can you use bottled lemon juice? 2. Can you use a cup of fermented lemonade as starter for the next batch, rather than whey? Hi Elise! Bottled lemon juice is typically concentrated and/or has other things added to it to keep it preserved I would guess (I could be wrong?) Just check those ingredient labels! Let me know if you give it a try! We love lemonade but I have yet to try it fermented…I will this summer though! That looks really good. 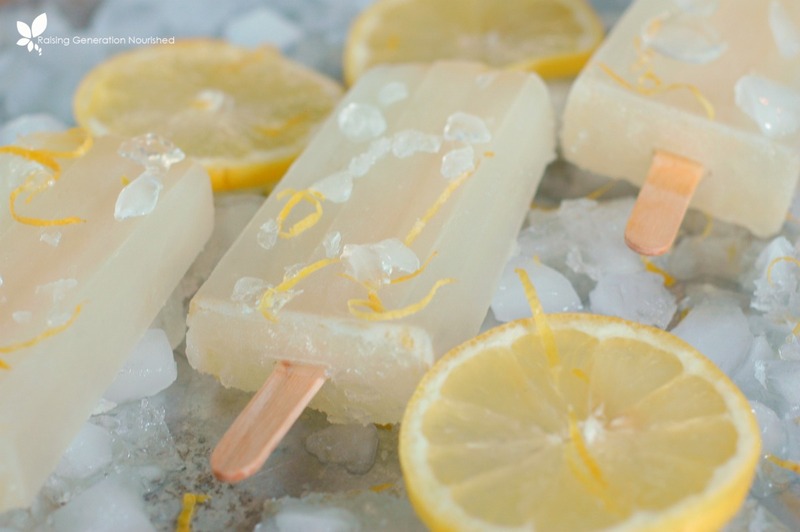 And with the temps near 100 here…some cold lemonade would taste great. I’ll have to try this out . Sounds cool and I bet it tastes delicious. I just don’t know if I could wait 3 days for lemonade,lol ! Thank you for sharing…I hope to try this one day. I love lemonade thanks for posting this. This is wonderful! 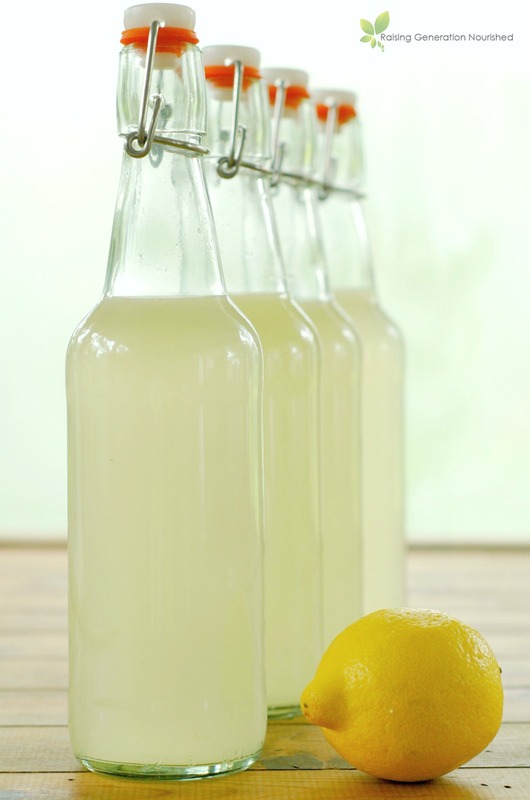 I love fermenting lemonade with water kefir grains! Interesting, I had no idea you could do this in a lemonade. I wonder if I could do something with a gluten-free grain instead, since I can’t do dairy? 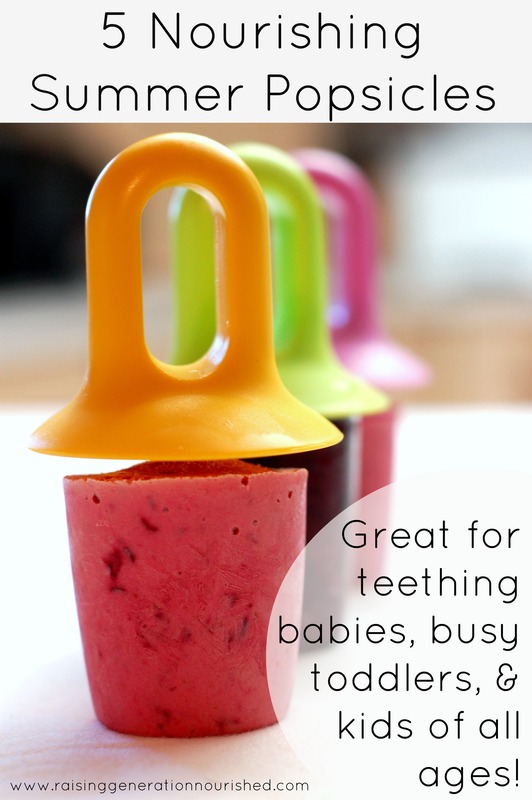 This looks like such a great thing to keep in the fridge. I am excited to try it! I’ve never seen a recipe for this before. Looks really interesting! Can’t wait to try this! What do you think about using some strong kombucha in place of whey to make a sort of fermented “Arnold palmer?” Shouldn’t that work? Hey Kylie! Yes – that should work! Hi Cheryl! I’m so glad you asked instead of wondering! That is a great question and I should have included it in the instructions! Drip it off overnight! This was a HIT at my house! Already made again! Thanks so much! Awesome Amy! That is so great to hear – glad the family enjoyed it! Question: Do you leave the lemonade out of the fridge for the second ferment? I saw that you said it would continue to ferment in the fridge, but slowly. Would it be okay to leave it out for as many as five days for the second ferment? Thanks! Hi Cindy! Yes absolutely leave the bottles out for the second ferment – in fact mine have been taking closer to a week to get where I want them because it has been so cool here – I like to put them somewhere warmer without a draft and they will ferment quicker. I hope that helps! I made this – left if for three days, then popped it in the fridge for three but it isn’t fizzy. Any ideas? Hi Bindi! It could have needed more days to ferment. If you live in a cooler area and/or the bottles where were a draft or you have air conditioning on in the house, it will take more like 5 or so days. I know we have been cooler this summer 70s and 80’s and it has been taking my drinks almost a week sometimes to get right. I have a few cups of whey and was wondering what to do with it! But I made the yogurt at the beginning of the week, and have no idea how long I can keep and use it for something like this. Can I still use it, or does it need to be used right away? My son would live on lemonade, if he could, and this would be a much preferred alternative — For him, too, because he loves the fizziness in things like kombucha. Hi Elaine! Whey keeps in the fridge for 3 months so you should be good! I have just made your recipe except that I used Jaggery sugar! I hope this doesn’t stuff it up because I am soo excited to drink it! It is quite brown at the moment from the darkness of the sugar! Hi Sonja! I’m not sure how jaggery will work! You’ll have to let me know! You will find in most fermenting literature to use just plain sugar for feeding probiotic bugs as in a drink like this because they feed better than on sweeteners such as honey, molasses, or even sucanat. I have tried sucanat before and it didn’t ferment as well. I’ll be curious to hear how the jaggery works! Hi Renee! I’m not really sure how this fermentation process work. Will this become alcoholic (hard lemonade)? If not is there a way to make it alcoholic? Ok this sounds delicious. Would you totally be ruining this recipe by making a cocktail with it? Like maybe add some lemon vodka? I am putting together a list of creative cocktails with fermented juices and brines. This sounds like a great one for the summer. 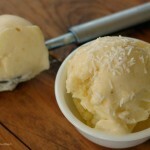 We are obsessed with fermentation at http://www.spoiledtoperfection.com. Cheers to a fellow fermenter. Hi Emily! What did you have in mind? 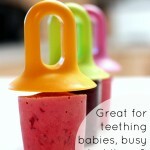 I have a bunch of whey left over from making yogurt so I’ll be making this for sure! Any idea of how much lemon juice this recipe takes? In cups? Hi Julie! That’s a great question – I will have to measure it out the next time – I typically just buy a 2lb bag of lemons and use that so I have never measured it out! Hi. For the first ferment do you seal the mason jar or is it a loss fit/cheese cloth approach similar to the first ferment of water kefir? Hi Kelly! Yes a loose fit. 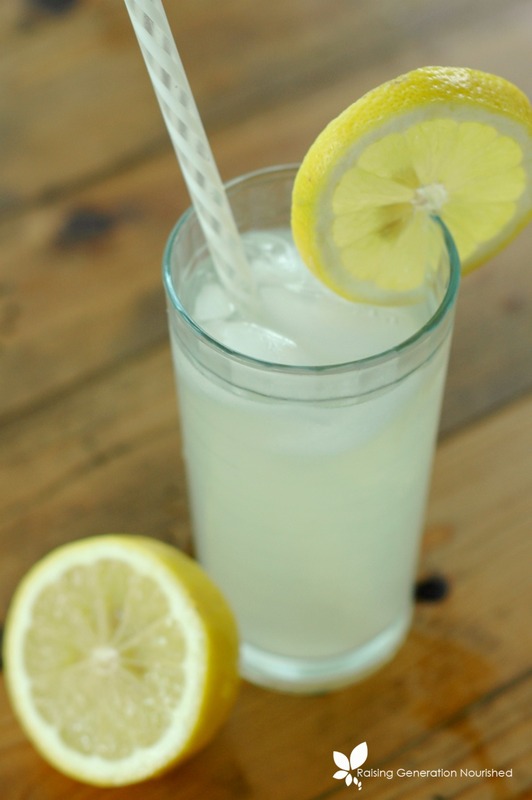 I made this awesome lemonade recipe using the bottled organic lemon juice from Costco (Italian Volcano brand). 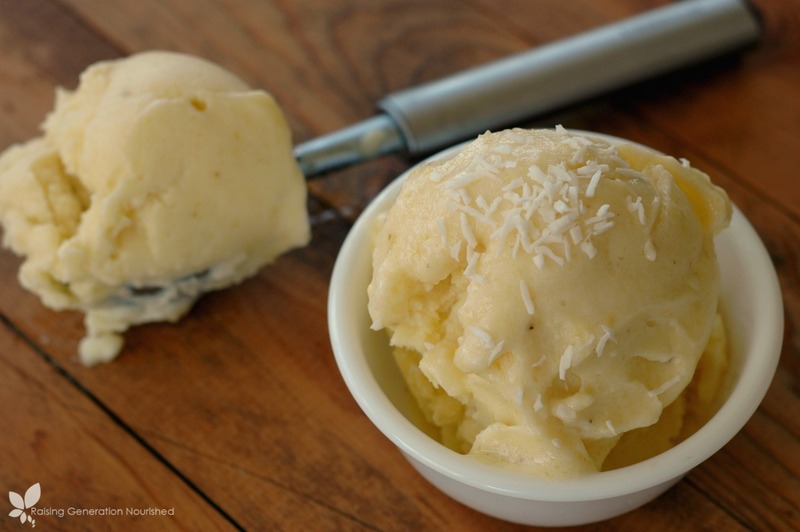 The only ingredient is fresh lemon juice. It turned out so good!! I put it in my flip top bottles and also GT Kombucha bottles on 3rd day and it got so fizzy just like soda after 2nd day. It tastes a lot like Sprite or 7 up. Cool! I don’t drink soda at all except for what I brew at home if you can call that soda so this was a lot of fun. Thanks for the recipe! Question-can you save a cup of the fermented lemonade to make a second batch of lemonade rather than getting a cup of whey each time? That’s a great question Nicci – I have not tried it but it would be worth a try I think! Hi, for the second ferment should you leave it on the counter or in the fridge? 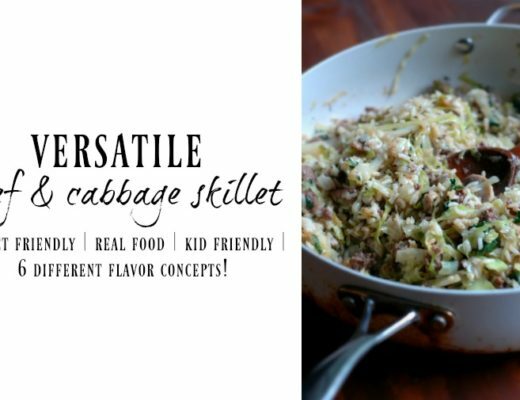 Thanks for the recipe, my kids and I are making it tonight. Hi Adria! On the counter! Hi Renee, thanks for the reply. One more thing though, we didn’t strain the pulp is this OK? Or do you think it can introduce bacteria/mold? Question. About how much whey should strain off of the yogurt? I get about a pint of whey when I strain off the 32oz container of yogurt. Hi Paula! Yes limes work! Hi Krystn! You don’t want the water too warm or it will kill off the beneficial bacteria that will ferment the drink. Lukewarm is fine and you might just need an extra day or so – you can taste along the way. 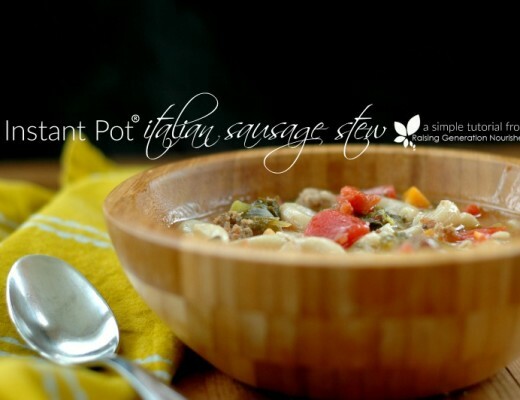 Set it up high in your kitchen were the stove is – warm air rises and it will be warmest up there. I can’t use dairy whey, and I have the same time problem for making a ginger bug. My newbie question is if soy based yogurts have a bioactive ‘whey’ or not. Hi Baruch! I am not familiar with soy based yogurts as we don’t consume soy. I am sorry I am not much help there! Sounds delicious! What volume of lemon juice do you get from 2lbs of lemons? I have a freezer full of myer lemon juice that I froze last fall just waiting. Great question Allyson! And I’m trying to picture what it looks like after juicing all those lemons – I want to say a good 2 cups or so? Hi Heidi! Extra whey will need more sugar to feed on so if you want to add more just add a bit more “food” (sugar) for the bugs to feed on. I have never tried fermenting anything at 50/50 so I’m not sure how the outcome will be! I hope it works out for you! Thank you for your reply, I am now bottling as it tastes so good! Do you stir or shake the big container before you bottle it, to get the white fuzzy stuff all around? Just gently tip it to disperse it throughout the bottle! Hi there! Making this, second day on the counter and it has a bit of a cloudy white ish layer about 1 inch sitting on the top. Have you encountered this when making it yourself? Hi Jessica! Yes that is fine – it is called Kahm Yeast and is harmless – part of the fermentation process. If it gets fuzzy or turns colors like green or pink then you will toss it. Second day shouldn’t present that unless the jar wasn’t cleaned well or the batch was somehow contaminated. I hope that helps! Hi, I was wondering what is the amount of lemon juice in ounces? I have a lemon tree but all of the lemons are juiced. Some of my lemons give a cup of juice. I freeze the juice and use it in everything until my next crop. I usually use 1 1/2 cups of juice to the same amount of sugar, then add about 1/2 gal. of water for lemonade. Would this ratio work with the whey? Or would it be too diluted? Or does it even matter? In the meantime I will experiment. I have 2 cups of whey from some homemade yogurt I just made and I’m really excited to use some of it in the lemonade. Thanks for the recipe. Hi Glenna! How wonderful to have your own lemon tree! That amount sounds about right seeing it in my head – I hope it turns out well for you! Hi, me again. So first of all, I love the lemonade. I’ve made it several times now. It disappears really fast. I made a batch of it and left it on the counter, then I went on vacation for 10 days. When I got home I tasted it and it was a bit fizzy. I popped it in the frig. Its been in there for 2 weeks. Do you think its still good? I’m afraid to drink it, but I don’t want to throw it away if its still good. I was thinking it may be like wine or hard cider. Should I try a glass? My grandson said it is the best lemonade he’s ever tasted. I told him be careful we might get drunk. I’m making more right now. 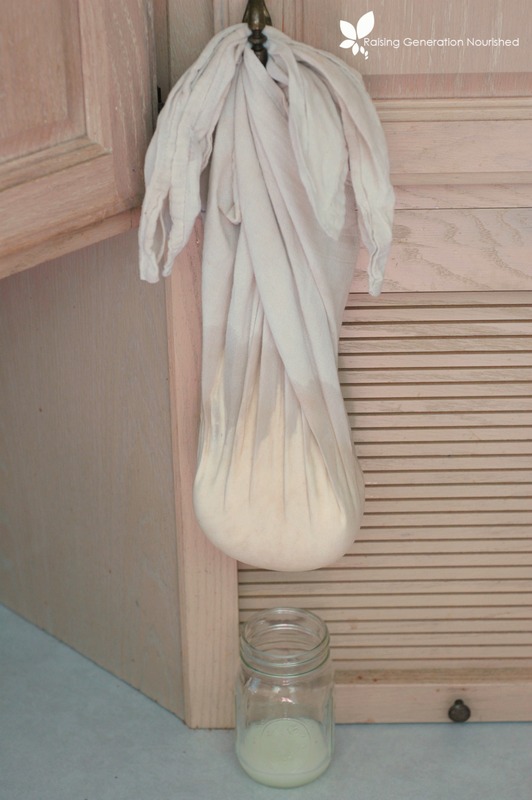 Nut milk bags are pretty inexpensive on ebay and work great. I was at a friends house using their vitamix to show them how to make rice milk. She didn’t have a nut milk bag so we tried using a clean but old kitchen towel. The milk took all the flavor of that old towel with it (repeated washing laundry detergent, etc). It made us gag, and we laughed hysterically at how gross it was. Please for the love of all that tastes good,,, recommend a nut milk bag before a dish towel. I just tried lemon ginger soda and I ferementec my drink with a ginger bug. I am ready to use it but want to know if I need to strain the lemon juice pulp that is in the lemon juice. Also, I am not very tolerant of carbonation. My question is: if I don’t ferment my ginger lemonade soda a lot as to get very fizzy, will it still have the beneficial bacteria probiotics if it’s a bit flat but has been fermented for 2-3 days? I’m a newbie on fermented sodas and want to give my family the alternative of healthy soda instead of Coca Cola. That’s great! You can strain the pulp if you wish! 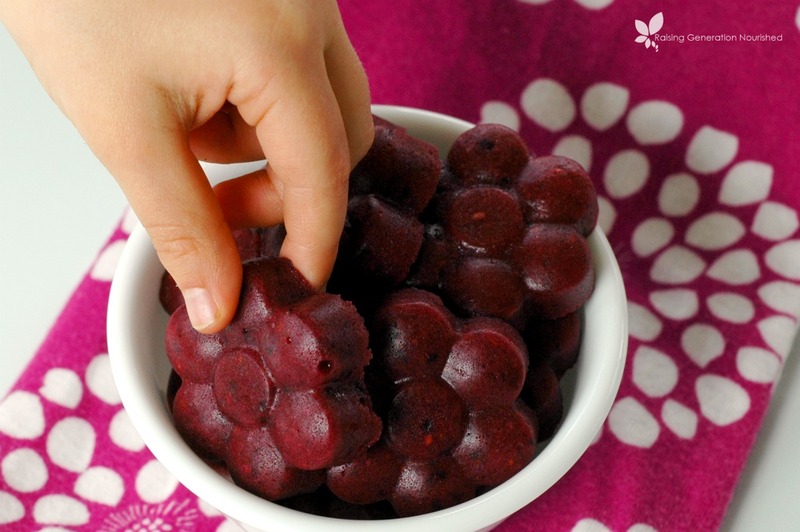 There is definitely still beneficial bacterial if you leave it “flat” for sure – ferment it to your taste! i do not have the flip top bottles, just half gallon mason jars. do you put the lids on tight or do you leave them little loose. Hi Rita! Put them on snug, and then “burp” them every day or so to let the gasses out by opening the lid, and then closing it back up. 1. What is the overall difference in outcome using an excellent probiotic powder vs kifer grains or a ginger bug? I use the probiotic powder to start my nut cheeses and they are amazing! 2. I put lemon water in my fridge for 3 weeks and it fermented on it’s own. It tastes great. Is it supposed to do that? Is it a good bacteria source now to go ahead and drink it? 1.) You could definitely use any of those mediums to ferment and come out with a great product. We use water kefir grains a lot. 2.) I would not drink it because when you add a good bacteria medium and ferment the drink quickly at room temp and then refrigerate, you are keeping the bad bacteria at bay – your drink may have had a good proliferation of both good and bad bacteria. 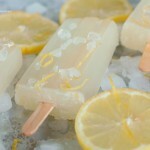 weird question.. i just juiced A TON of lemons and want to use some of it to make this. Do you know how much i should use? like 3 cups or something? Hi Shalee! I have not measured it before – I’m sorry that doesn’t help much! I am trying this out for the first time, I am used to making wine and the fermentation producing a lot of bubbles. I don’t see much activity here after a couple days, is it less active with the whey as opposed to yeast? That could be Ray – it could also just be fermenting slower than you are used to with yeast depending on the temperature of the environment as well. Hello- would this work the same way with orange juice? Hi there i wondering, should i put the lemons in the jar too when i fermented it? If i dont have cane sugar i never seen that in north sweden there i live. Maybe i can use raw brown sugar then?? In lapland we have cold snow weather and its pretty cold now but i prefer to drink a cold lemonade anyway, when its +10 it feels like summer. I think that would work fine Alexander! And just the lemon juice for the ferment! I made this and left it out for the second ferment. I didn’t have a gallon jar so I also divided the liquid in half. By the third day of the 2nd ferment, it had developed mold and I had to dump it all. Any idea what could’ve gone wrong? Hi Brandi! Mold typically happens that quickly if the jar wasn’t clean or whatever was covering the jar wasn’t clean. Do you just leave the jars open to breathe for the first ferment or lid on tight?